Rose is on a bit of a vegetarian kick lately. 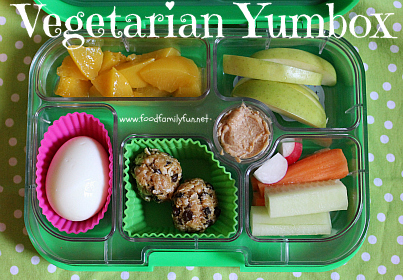 We could all use a few meatless meals so everyone had similar vegetarian lunches packed in their new Yumboxes. This is Amy's very easy to pack vegetarian school lunch. Amy has diced peaches, sliced apples with a yummy greek yogurt & peanut butter dip (recipe from BentOnBetterLunches), sliced veggies - radish, carrots & cucumber. There are 2 no bake energy bites (recipe from MOMables) and a boiled egg. Most foods in this lunch were considered her favourites so I thought I could sneak in a few new tastes like the dip and the radishes. Amy didn't like either, but her sisters sure did! Rose & Heidi had extremely similar lunches. Rose had pineapple instead of peaches and Heidi did not have radishes or cucumbers. They ate everything from their lunch save a few bites. This lunch was extremely fast to pack! The boiled eggs were made the night before using this fool proof method and I had also made the energy bites ahead of time. Packing all 3 lunches in the morning took less than 10 minutes! Now that is FAST. My Favourite 13 lunches of 2013!